Although many young band students DREAM of becoming a successful performance major in flute, unfortunately the actual reality is quite different from the dream. In order to obtain a living wage or any kind of paycheque from performing on the flute, you need to be a spectacular musician with many years of training prior to entering college or university. You need to practise from 2-4 hours a day around your other university classes. You need to already have some music theory, ear-training/sight-singing, keyboard skills and a basic understanding of the history of music, so that the homework does not cut into your practising time. You need to choose electives that don’t have too much homework so it does not cut into your practising time. Getting sufficient sleep, staying healthy, studying well for tests, preparing for performances, dealing with a crazy time-table. You will also have to develop skills in eating properly, exercising to avoid injury, perhaps learning to cook, learning to do laundry. You'll also have to pay rent, pay phone bills, learn to perhaps work a part time job, as well as to learn to get along with or work around crazy roommates. In addition to all this you must pass all your music courses while practising 2-4 hours a day over four years. If you do not picture yourself doing all that practising, you must seriously consider entering a non-performing branch of music, which demands only 1 to 1.5 hours of practising a day. But if you are in any kind of University level music, you must practise. No, you won’t have much of a social life, and you won’t have time to cook large dinners for all your roommates, or do all of the dishes either. You will have time only for working on your course load while practising literally every spare minute. More helpful articles for the future are here also. First off, thank you, because this post is interesting, challenging, and yet oddly encouraging. I know I'm getting proper flute instruction and have for a few years, and I know it's bazillions of times more worth it than school band (Personal experience here! I'm sooo glad I'm Homeschooled and could just LEAVE! ), and I know it's harder. I also know I'm practicing 2 hrs a day now, and that if I had the time aside from the 2 hrs of piano practice and other crazy schedule of music-related things and other high school school work, I could do more. Yes, if you just plug along everyday, then everything eventually falls into place. A recent book that came up in another conversation I was having was about "tortoise mind, vs. Hare mind". (I'll go find the link). Some of our most brilliant ideas come to us when we're plodding along in a meditative state. So just "every thing in moderation" as our grandmoms and moms tell us, and it all comes out fine. Here's the link to the book Hare Brain Tortoise Mind. I'm going to order it from the library. I KNOW this from my own experience to be true in concept. Jen, Sorry to seem like I am just posting comments everywhere...but this is important. 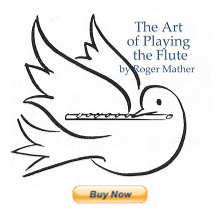 If aspiring flutists are not purchasing and practicing just as much on piccolo and alto flute, THEY NEED TO FIND ANOTHER CAREER. As a grad student, I was amazed by how much I got to do just because I was as good on piccolo as on flute...I would dare say I was a better piccolo player than flutist. In both years of grad school, I shared the orchestra's principal picc position with one person. I pretty much had free reign. LOL Now that I am older, I realize that I should have embraced the piccolo more instead of being so focused on flute and wanting to be a great flutist. The lesson here is to grab opportunities that hit you in the face instead of longing for others. However, those opportunities do not come without stepping out a little bit and trying new things.